Most cities don't have the courage or girth to host a bacon festival with 170 restaurants showing off their food alchemy chops to cook more than 7,000lbs of bacon in a weekend. 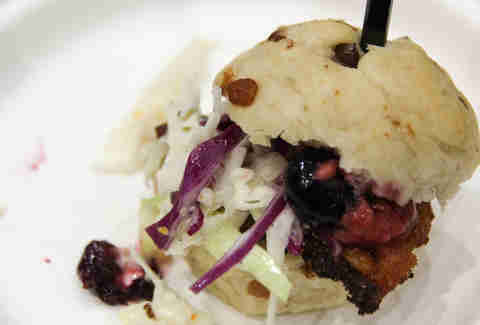 We went, and here're 50 dishes that we wish we could've eaten all at once (yes, we're mortal). 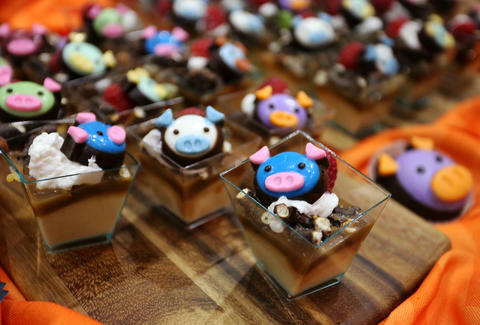 The pig faces were adorable enough to eat in the caramel Budino filled with applewood-caramel sauce and salty chocolate bacon-covered pretzels. Onion rings are nice. 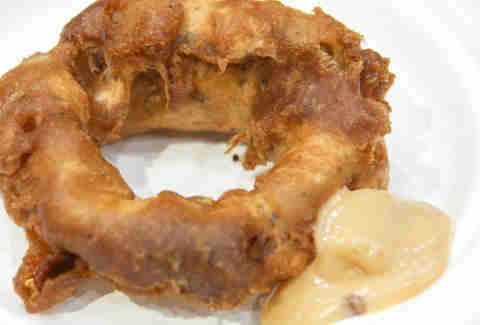 Alpha King beer-battered, bacon-wrapped onion rings are better, especially when complimented with house-made curry ketchup. It was easily the best use of beer in the room. You’ve heard of candied bacon. Well, this is bacon candy. 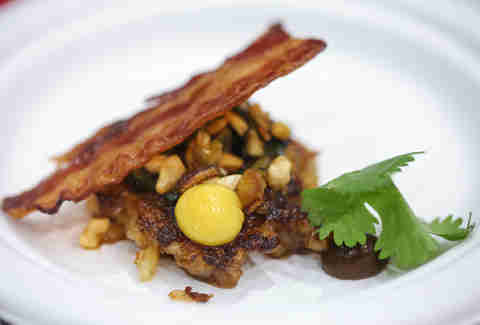 It was applewood-smoked bacon, bacon fat caramel, bourbon nougat, peanuts, milk chocolate, and sea salt. The white crumbles on top? 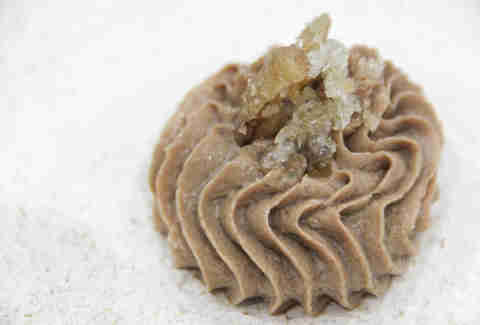 Dehydrated bacon fat. 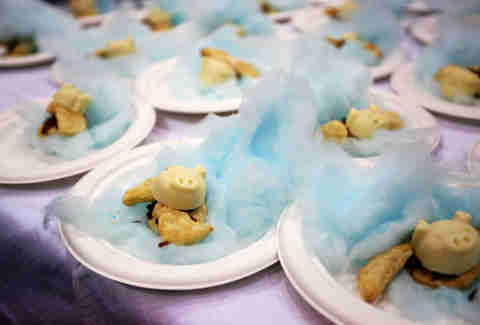 All fairgrounds should have cotton candy with white chocolate, Letherbee Besk, and a bacon hand pie. 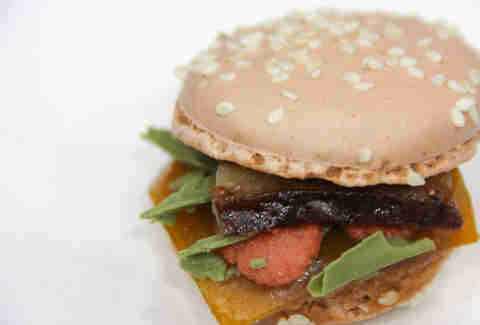 TDS proved that bacon really does go with everything. 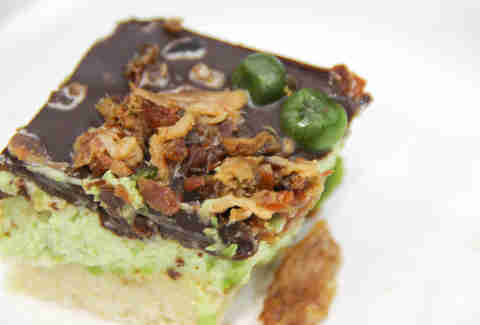 That’s the only explanation for how bacon custard pie and peas could possible come together so perfectly. 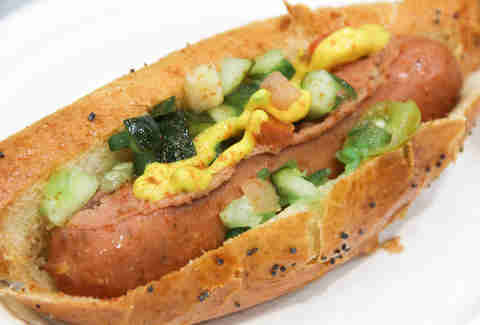 If there’s one thing Chicago loves more than bacon, it’s hot dogs. But who says you can’t have both? It wasn’t the only bacon Chicago dog in the room, but it was easily the best. Make a wish. More bacon? 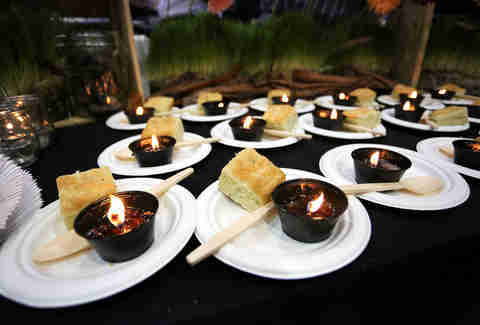 Okay, here you go, a candle that burns with bacon fat that may have perturbed any fire marshals working the event. 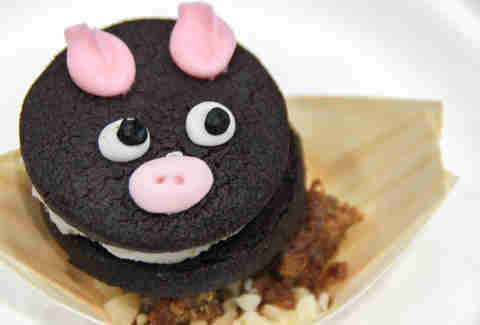 Chocolate-bacon Oreos might be cute, but they were also delicious. The bacon Pop Rocks hiding beneath were definitely the most creative use of bacon and nostalgia. 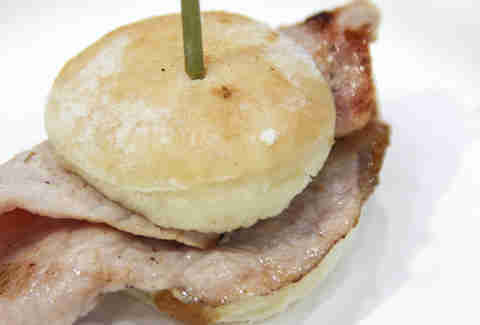 There’s nothing blah about this Irish-style back bacon on traditional blaa-style roll. 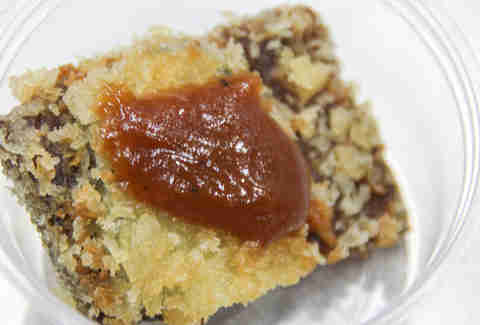 The homemade “HP Sauce” (brown sauce popular in the UK) is the perfect finishing touch. Steak and bacon should be the next big trend. This was like wrapping happiness with heaven then topping it with bacon-fat hollandaise. Pastrami might be the new bacon. The Signature Room's pork bell pastrami, scotch bonnet slaw, and scorched fruit on a bacon focaccia roll tasted as good as the restaurant’s view. 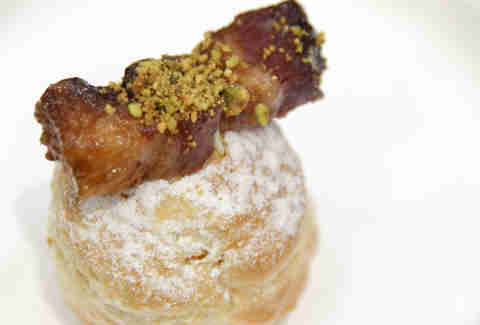 You’ve probably never heard of a gougère, but the delicious pastry is irrelevant once you tack on baby bacon lardons topped with crushed pistachio and bacon-fat powdered sugar. Yes, the usually useless powdered sugar is bacon fat. Picture a bento box made entirely of food. 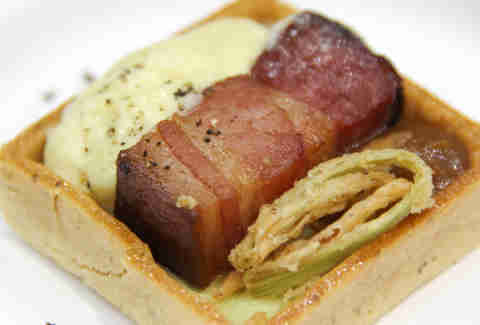 This is it, lead by Vidalia-braised applewood-bacon along with ramp soubise, black pepper hollandaise, and crispy leeks. It’s the most organized bite of food I took all day. 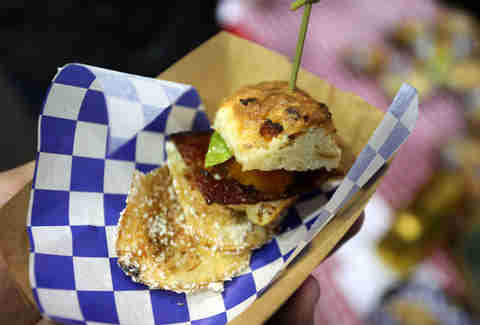 Buttermilk bacon cheddar jalapeño biscuit? Check. 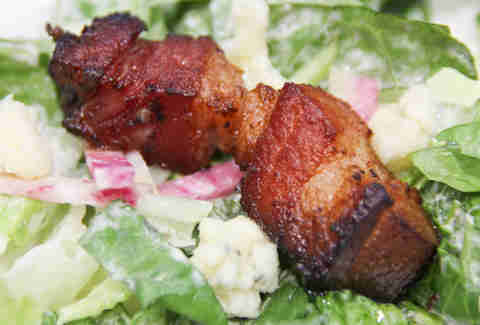 Bourbon-braised bacon? Check. Country-style bacon gravy? Check. 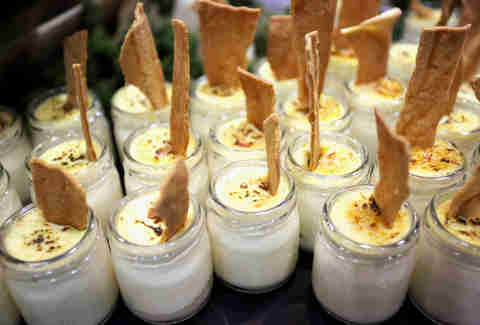 All of that, and they still threw candied bacon on top. Hats (and belts) off to Stout. Shrimp wrapped in bacon is always a stellar choice, but Whisk upped the ante by stuffing the shrimp with pepper jack cheese. Mango salsa was the perfect finishing touch. 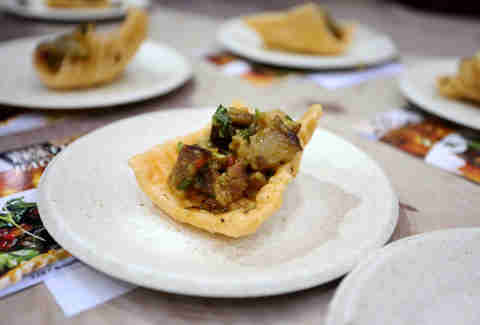 This crusty open-faced tart topped with crispy bacon might just be the gateway drug to a lifetime of indulging in meat pies. 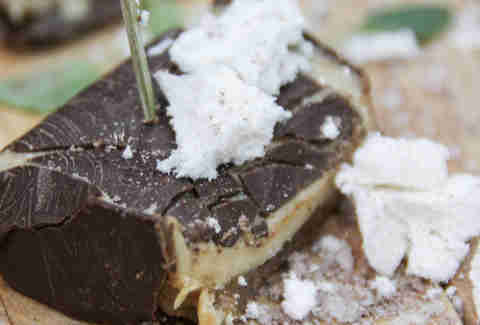 Campfire snacks have never been as good as this roasted-bacon marshmallow with chocolate bacon bark melted between graham crackers. 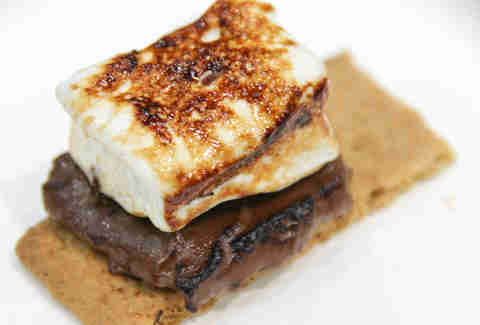 Normal s’mores will never again get the job done. A welcome spin on a ballpark food that nobody likes, if only you could wash it down by chugging a beer that you caught a foul ball in. 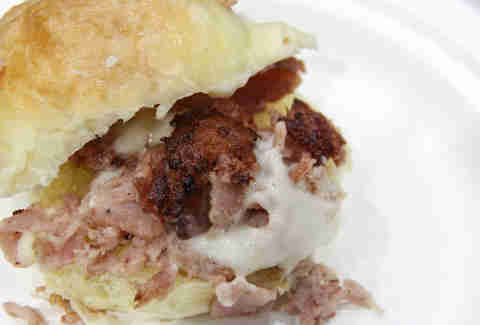 Bang Bang won many a fans heart with red ham gravy BLT featuring its signature biscuits studded with bacon alongside potato chips dusted with bacon and ranch flavor. 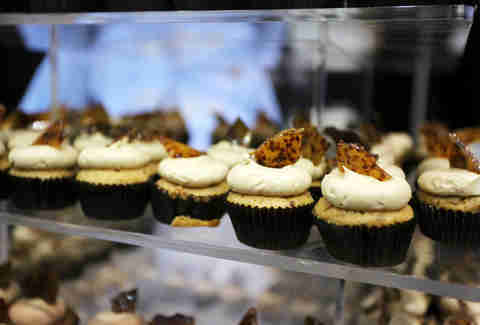 Bacon-maple cake with a brown-sugar-maple buttercream garnished with house-made bacon brittle IN CUP FORM! 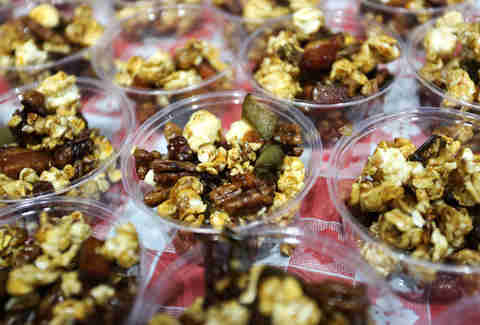 Soup at Baconfest; why not? 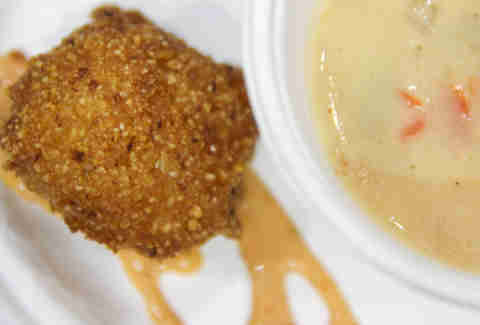 Hickory-smoked bacon-garlic soup and a cherrywood-smoked bacon hushpuppy were the perfect pairing. They threw in some smoked bacon aioli for good measure. 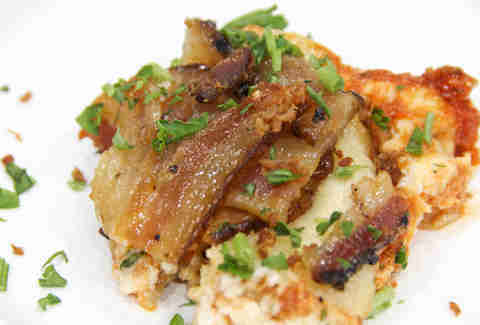 Lasagna layers have never been better than bacon pasta, bacon ricotta, bacon bits, bacon sauce, and bacon bacon. They threw in bacon barrel-aged whiskey for good measure, too. 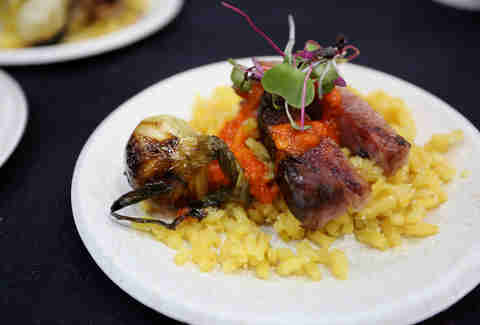 Chef Cesar Gutierrez impressed with braised pork belly served with bacon-infused Parmesan risotto, even pairing it with a salted caramel bacon gelato. 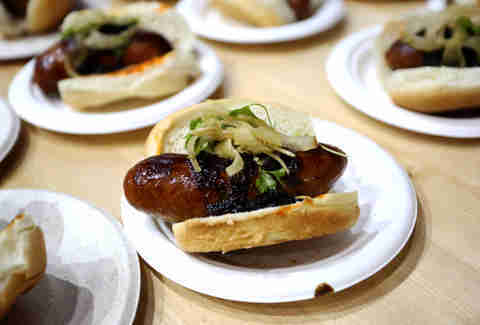 While gearing up for Dark Lord Day, the chefs at 3 Floyds assembled a bacon-y hot link topped with bacon jam, pickled fennel, and Dark Lord hot sauce (made from ancho and guajillo chili peppers used in their barrel-aged beer variants). Stew on a plate could be a dicey operation, but it paid off with this peanut-braised pork belly, green beans, and bok choy. 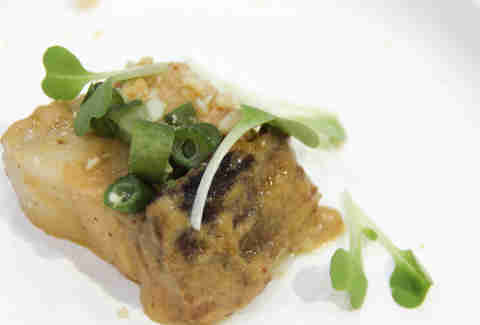 It was a single bite of Filipino heaven. If this sausage with bacon and cold brew coffee along with banana blossoms, mint, and lemongrass is any indication of what we can expect from HaiSous, Chicago is about to fall in love with Vietnamese food. My bologna has a first name; it’s A-U-T-R-E. If only childhood bag lunches were as good as this fried bacon bologna slider with Dijonnaise and bread-and-butter pickles. It might look like fancy chocolate mousse, but this is actually perfectly aerated pig liver topped with bacon with crostini. 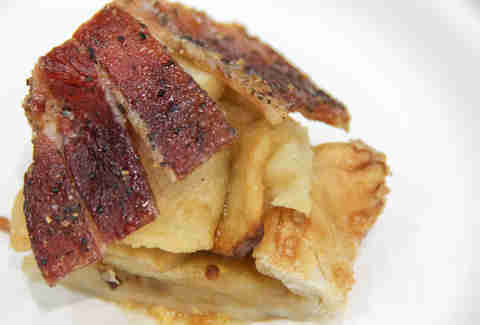 Dessert bacon is the new hotness. 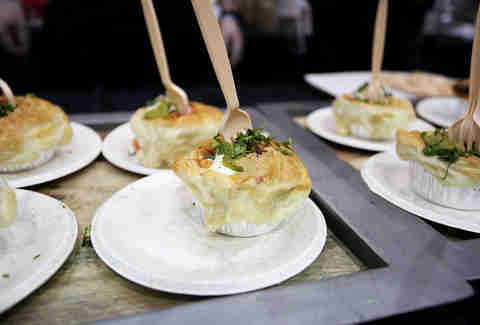 Fest-goers were free to dress their Bacon Biryani at the self-serve chutney station with garlic/mint yogurt, green chili chutney, apple tamarind, curry mayo, and red fire chili. This was easily the most fancy grilled cheese I’ve ever had. 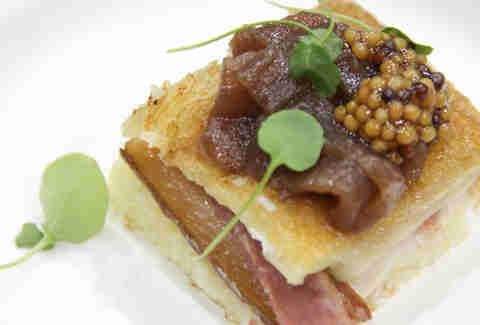 It was confit of bacon, truffled brioche, camembert, Mornay sauce, shallot jam, and mustard caviar. Who knew grilled cheese necessitated eating with a pinky out? This was the only lettuce in the room, but it was coated with grilled ramp ranch and added house-made bacon lardon and blue cheese. I’m still calling it healthy bacon though. 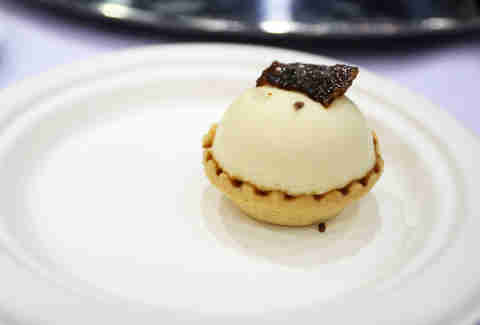 The creamy dome of maple mousse (topped with candied bacon) went well with the texture-contrasting base of bacon fat bourbon caramel. 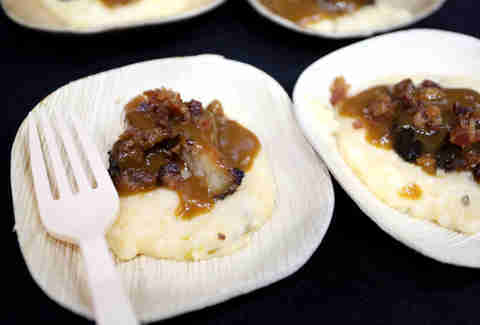 Creamy white cheddar and bacon-stone-ground grits with red eye jus with some crispy citrus cured pork belly nestled on top. 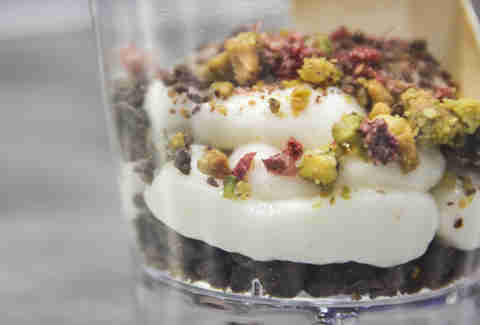 Dairy Queen could learn something from this amazing parfait comprised of chocolate bacon bits, white chocolate bacon mousse, and raspberry bacon crumble. That lesson? Every layer needs bacon. 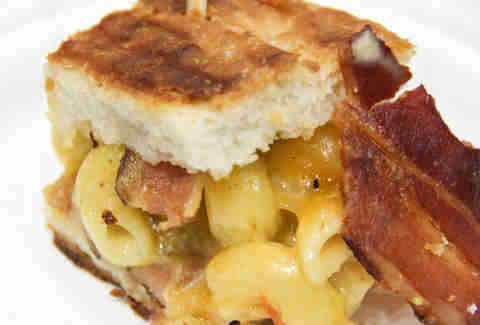 I’ve always thought grilled cheese would be better if it was made with bacon mac & cheese instead of boring slices, and Blue Door proves I was right. Bacon. Fried. Pickles. I repeat. Bacon fried pickles. This is clearly the greatest appetizer on Earth, even before factoring in the habanero BBQ sauce. 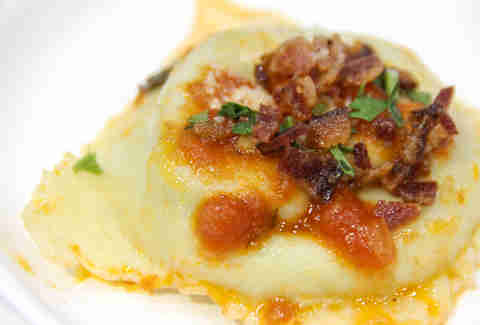 This spinach- and ricotta-filled ravioli with a house-made tomato and bacon sauce was the best dish in the house. I might have had four of them just to be sure. This house-made bacon sausage with bacon curry sauce and goat milk tzatziki tastes just as good when it’s not being served from a food truck. 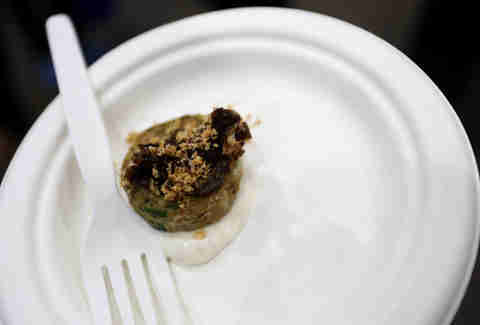 Homestead chef Christ "Chip" Davies turned in some Mediterranean flavor from his native country, Egypt, with a green chickpea bacon falafel, spiced crème fraîche, and lemon/bacon jam. 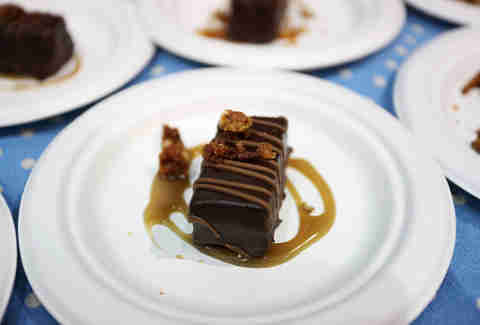 The key chocolate/bacon combo on Saturday was Davanti Enoteca's bacon candy bar drizzled with bourbon toffee sauce and pretzel bacon crumbles. I’ve never been a grits man, but Celeste has changed my mind. 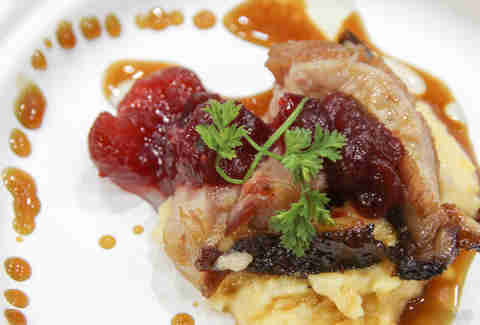 It might have something to do with the perfectly grilled pork belly, honey-poached cranberries, and roasted carrots. 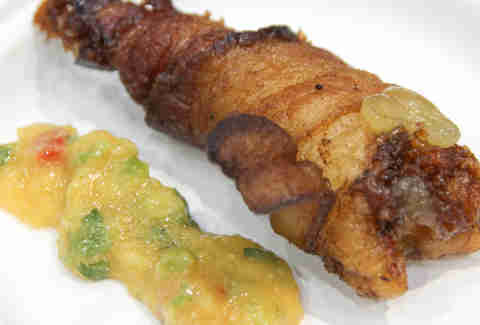 Knowing that Dorito hybrid dishes have evolved into an art form, nana turned out a bacon-fat fried chip with a bacon salad. 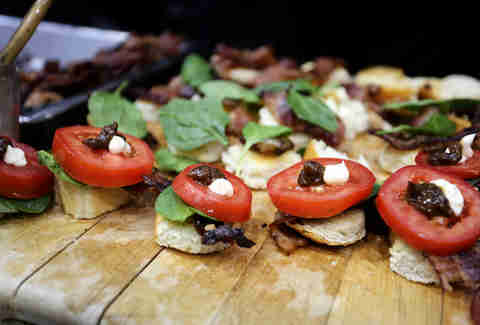 The open-faced Baconater BLT (trademark lawsuit to follow) served as a simple, refreshing bite topped with bacon aioli. 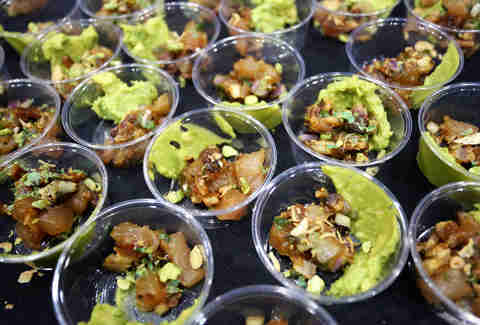 Hawaiian-style bacon and albacore poke laced with inamona, avocado, ginger, chili water, sesame, and shoyu. 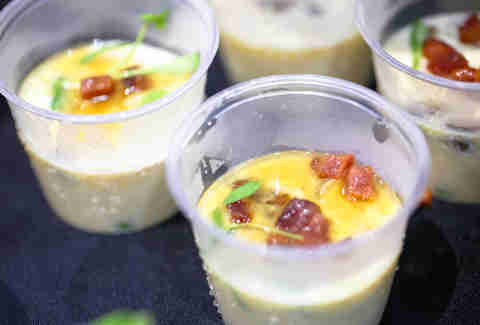 Patrick Sheerin's crew took home the Golden Rasher Award on Friday for a fried rice dish made with cherrywood bacon and house-made bacon fat hoisin sauce. Ramen hub Slurping Turtle won the Golden Rasher for Saturday's lunch session with a chiyawanmushi cup of shiitake mushrooms, gingko nuts, bacon-dashi glaze, and wasabi. 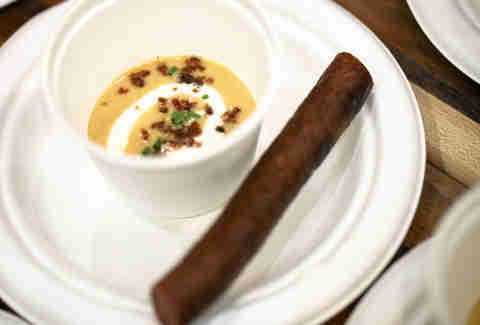 Now the bar for a Slim Jim is pretty low, but Vie went over the top with a house-smoked bacon Slim Jim and a potato-bacon soup to win the Golden Rasher Award for Saturday's dinner session. 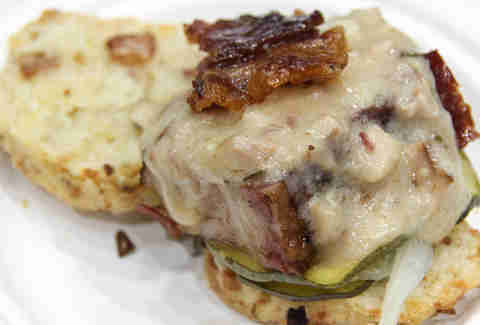 Macaroons usually don’t look like much, but this bacon and maple macaroon was built to look just like a little burger. They nailed it right down to the poppy seed bun. 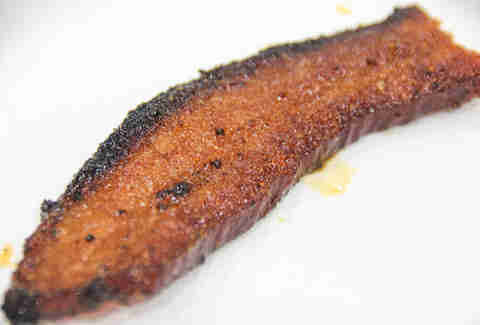 Q got right to the point of Baconfest with this apple-smoked candied bacon coated with its award-winning 13-spice Pig Powder Rub. It’s literally a slice of heaven. Sean Cooley is a Senior editor at Thrillist, and he's still amazed that RBI Baseball 3 gave Dennis Eckersley his own special throwing animation. Follow him @SeanCooley.